As most of you may recall, the winter olympics took place in Park City in 2002. You cannot go to Park City without visiting Olympic Park. It is truly a site to see and it is very interesting how they continue to utilize the park today. I highly recommend paying $7 for the hour long guided tour because you will learn more than if you just walk the museum yourself. On another note, I have to share with you the MOST ADVENTUROUS thing my husband and I did while we were in Park City! The Olympic Park allows visitors to take bobsleds down the actual track that the Pro's go down! This means that you go on a ride of a lifetime. In less than 55 seconds, you travel almost one mile at 80mph and experience 5G's of force. Do you know what 5G's of force feels like? You can't even lift your head up because the bobsled is going so fast. There are four people in the bobsled including the professional driver. 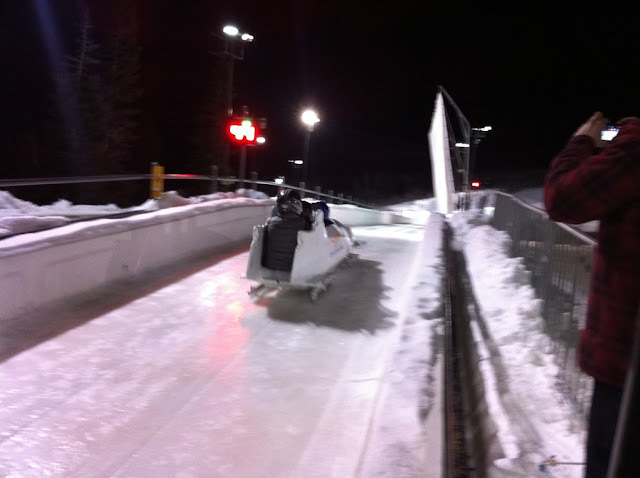 Here is a picture of me getting into the bobsled. 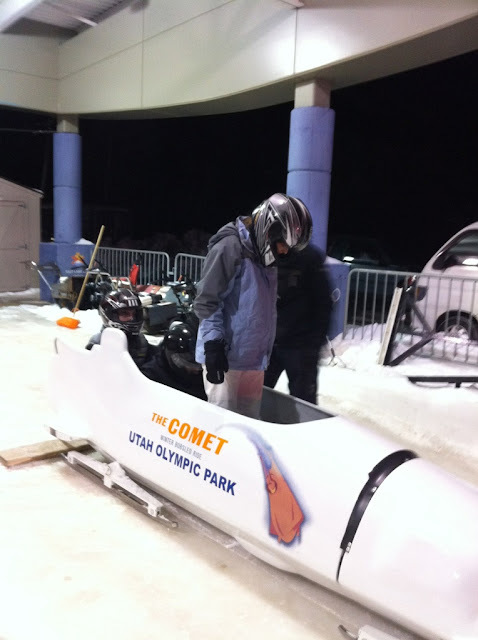 Below is a picture of my bobsled at the very start. This 55 second bobsled ride comes with a pretty hefty price tag of $200/person. At first, I was sick to my stomach paying this much but in hindsight it was well worth it. There are people that have bungee jumped and sky dived before and say that neither compares to this! Of course there is danger involved in riding the bobsled but no worries there are two EMT's waiting at the end of the course to examine you and make sure you are okay since you endure 5G's of force! You can go to the Utah Olympic Legacy Website to find out more information about riding a bobsled or taking a tour of Olympic Park!